I don't understand why my 3D Plot is empty so was looking for some advice. 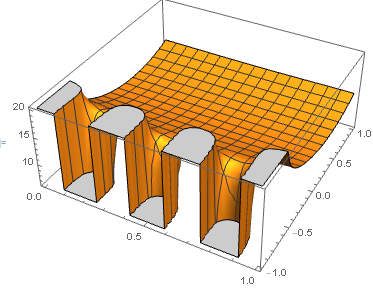 I have several functions defined, one of which is used in Plot3D, as seen below. and Mathematica just outputs an empty plot. Thanks in advance for any help, hopefully I have just missed something simple. Do not use ) after the semicolon use it before. Why empty plot (Dsolve solution)? How to plot the ranges of the variables of an iterated integral? How do I plot a function that contains variables I have previously defined?